Print developing drums provide a convenient means of processing colour and B&W prints in daylight, using a minimum of chemical solutions. Once the print has been loaded in the drum and both end caps are in place, all processing steps can be carried out with the lights on. Chemical solutions are added and emptied from the drum through a light-tight spout. The drum can be manually agitated by hand, or using an optional motorized agitator. Both end caps can be removed for thorough cleaning and drying. The Simma 8x10 drum can accommodate one 8"x10", two 5"x7", or four 3½"x5" or 4"x5" prints. 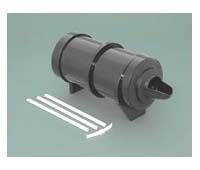 Supplied with three adjustable paper guides, one print separator, instruction sheet, and centering ring for use with the Simma-Roller motor base. The drum has outside dimensions of approximately 12"L x 5"W x 5¾"H.